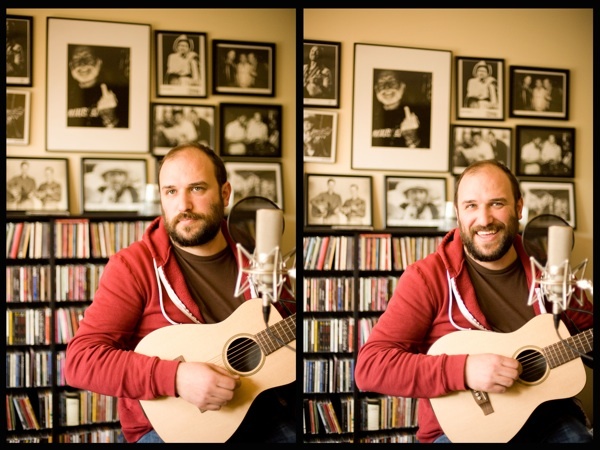 It has been nearly two decades – 16 years precisely – since singer-songwriter David Bazan first emerged on the indie rock slowcore scene with his solo project turned two-man band, Pedro the Lion. Beginning with 1997’s Whole EP on alternative Christian label Tooth & Nail, Bazan soon signed with Jade Tree, with whom he released four full-lengths and a handful of other releases. After a short stint as the band Headphones, Bazan ditched the band names and began performing under his own name in 2006. Meanwhile, it’s safe to say that Bazan’s ideals and beliefs have followed a trajectory similar to his various projects, with each one representing a different phase in his life. Case in point: the end of Pedro the Lion and beginning of Headphones occurred in 2005, shortly after Bazan began dealing with tougher kinds of questions, mostly pertaining to the way he was raised and his outlook on faith. And after a couple of years of dealing with the fundamental questions of existence and morality, Bazan was able to piece together his own ideas about what he really does believe – ideas which are still evolving and growing and regularly being challenged. As to the deeper questions of what he believes, again, Bazan couldn’t pinpoint anything exactly, but he did refer to his upbringing as a way of highlighting the differences between the spiritually driven lyrical content from Pedro the Lion as compared to his current belief system and creative output. Bazan explains all of this with a humble curiosity, suggesting that a lot is still up for debate or discovery, but that he’s OK with that. In particular, music has always been a vehicle for him to safely explore the realm of spirituality, morals, and belief systems, and no doubt about it: solo album number three will likely continue in the same manner. Yet at the same time, he did point out that there was a new experience after he released his last album in 2011. What is meant by that, Bazan couldn’t specifically pinpoint, other than to say that he suspects it will be a quieter record. He also likened the process to reaching toward the “Garden of Eden scenario,” in that he wants to return to his roots a bit more and, somewhat paradoxically to his intellectual journey, not question everything musically so much. Interestingly enough, Bazan shared that his first album is the one that best mimics what he is seeking to do with his upcoming full-length, something he realized when he was mastering the Pedro the Lion records. This entry was posted in Interview and tagged American, David Bazan, Feature, Interview. Bookmark the permalink.